Not just any old garlic, but even more specifically, raw garlic. And here’s the beautiful thing about garlic… you can buy it at any grocery store. It keeps for a long time in a cool, dark place or in your fridge. There’s no reason not to have it on hand for when sickness strikes. I’ve actually written a very lengthy piece on how garlic works and its benefits, but allow me to condense it for you. 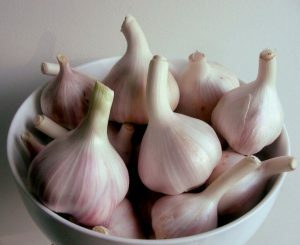 When raw garlic is crushed or minced, compounds within it are activated which have a very strong anti-biotic effect. It also has anti-fungal, anti-viral, and anti-inflammatory properties. It really needs to be raw to be truly potent, and is more active once minced or crushed in some way. You can’t take it once a day like an antibiotic pill and hope for the same result. It’s not a pharmaceutical. To get great results with many natural remedies, you want to take them steadily over the course of the day, every few hours. If you take it this way, you’ll be amazed at the results!